You might not realize this, but in addition to pickling everything in sight, I’m also a big fan of turning things in fritters – you know, shred it, add flour, baking powder, seasonings, egg & milk and fry it up in a nice little patty presentation. Latkes are essentially fritters. Squash are excellent fritters and we eat corn fritters weekly during the summer, when I buy corn on the cob by the gallon. You can make a meal of corn fritters, adding some cheese and bacon bits to them…. I’ve been experimenting with spaghetti squash lately. I like it, but serving it in lieu of pasta with some sauce, especially a red one which is supposed to be healthier than say, a cream sauce, gets kinda old kinda quick to me. (That may be my next experiment with it now that I think of it – a spaghetti squash alfredo dish, because I like to mix my healthy with my not so healthy, everything in moderation you know, including moderation.) I made a wonderful little casserole with spaghetti squash a few weeks ago, combining it with ricotta and spinach that went over well. I had a squash in the fridge I needed to use up, so I threw it in the oven Saturday evening. 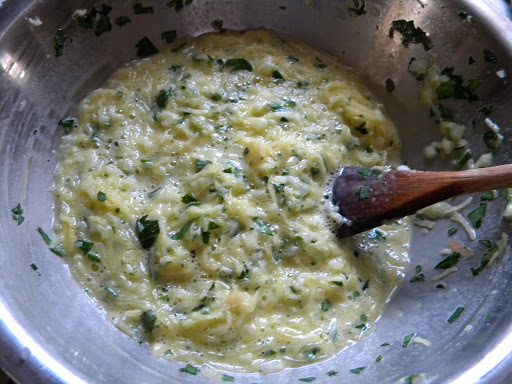 As it cooked, I thought how it might be very well suited for fritters – after all, it’s naturally shredded. I mean, hello, it’s just asking to be frittered, yes? 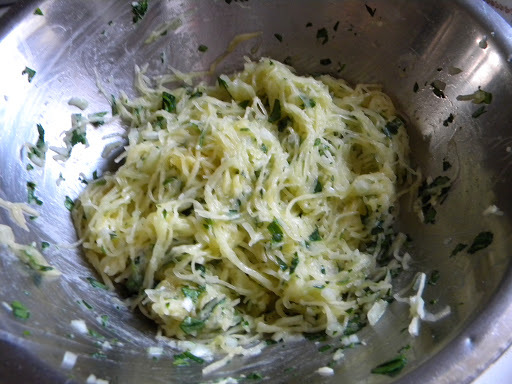 For various reasons, the spaghetti squash fritters got bumped to brunch Sunday morning. I added about half a finely diced onion, a few minced garlic cloves, finely chopped parsley, salt, pepper, baking powder, flour, beaten eggs and milk. I wish I had photos of lovely golden brown fritters to show you, but for the most part, they turned out looking exactly like that batter there. No matter how much flour I added to absorb the liquid, the batter remained exactly that liquidy until cooked. Honestly, all that liquid did in the frying pan was turn solid. They were edible – I think the spices is what made that so – but they didn’t look pretty. I may have added one too many eggs. I may have added too much milk. I may have not fried them in enough oil. It may have been A, B, C or D: All of the above. At any rate, my grand inspiration to share a delightful new way to enjoy spaghetti squash was most certainly not realized. Sigh. That’s the thing with experimenting in the kitchen – even the best cooks have failures. Sometimes that’s just the way the cookie crumbles. Or the fritter fries…. I know what you mean! Recently I made a recipe using a commercial bread product one often finds in the cooler section of the grocery store. I know better than that! The resulting Italian open-faced sandwich was gummy in the extreme. After it went into the trash can, I bumped up the accompanying salad with more veggies,etc. But what a waste that bread was…I hate that! As I read, I was preparing myself to do that thing I seldom do–cook. Mmm, squash fritters. Yum. My mouth is watering. Sounds fabulous. And sounds like something that my anti-veggie hubby might even eat. I. Can. Do. This. Then, no recipe. Oh, well. I guess that I am truly not meant to cook. That was quick and easy. Almost got me there. Whew. Thanks! I've never done (yellow) squash like that and my mom tells me it's the best way she's ever had it. Heck, I admire you for TRYING!